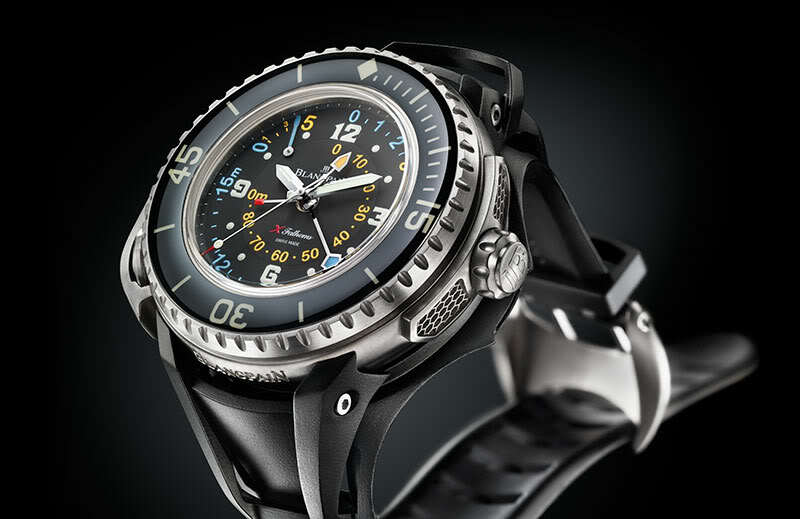 Europe's largest watch retailer makes the Bathyscaphe bluer! Customized, special editions sold only through a single (branch of) boutiques is a common thing, but few do it as regularly as Bucherer. The Swiss watch retail house has introduced several striking collaborations – no less than 25 in total with 14 different brands. To name just a few, the Tudor Black Bay Bronze, the IWC Portugieser Chronograph Classic or the H. Moser & Cie. Venturer Small Second, for instance. 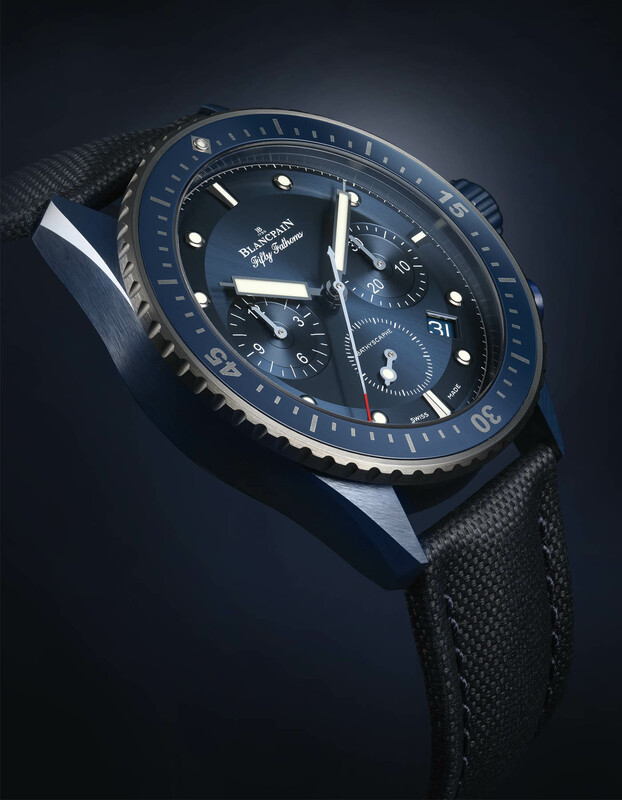 All received the “Bucherer Blue” makeover and next in line is the Blancpain Fifty Fathoms Bathyscaphe Bucherer Blue Edition. 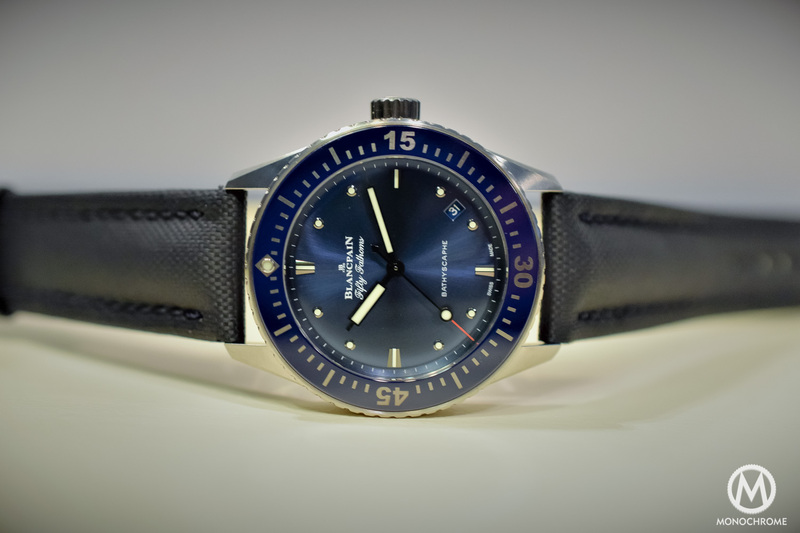 A Bucherer Blue Edition is always (spoiler alert) blue – and the retailer’s take on the Blancpain Fifty Fathoms Bathyscaphe is no exception. 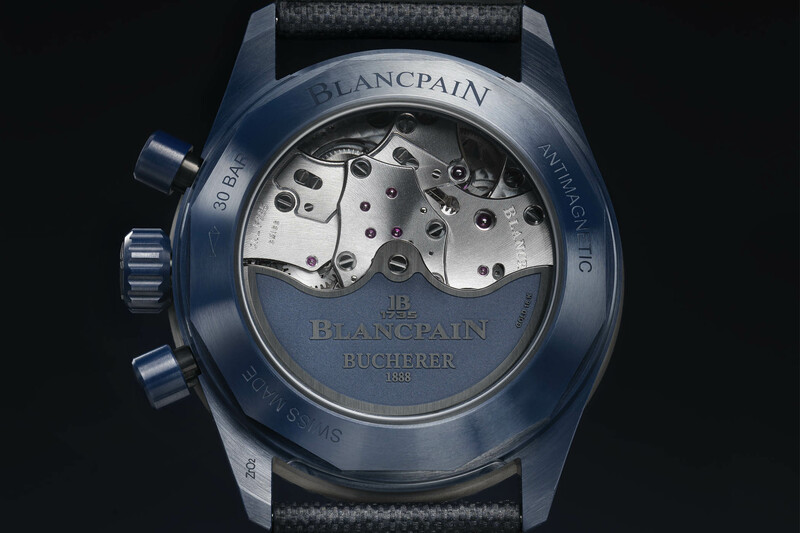 The colour fits the overall concept behind the watch well, considering the unique tone used in the watch is a Bucherer signature and blue echoes the maritime background of Blancpain. 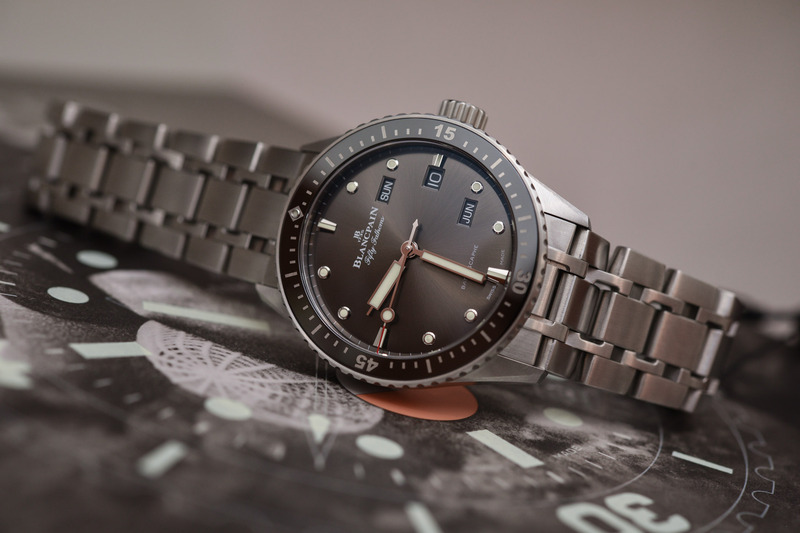 The Fifty Fathoms is, of course, the iconic dive watch introduced by Blancpain in 1953, at a time when dive watches were a groundbreaking novelty. 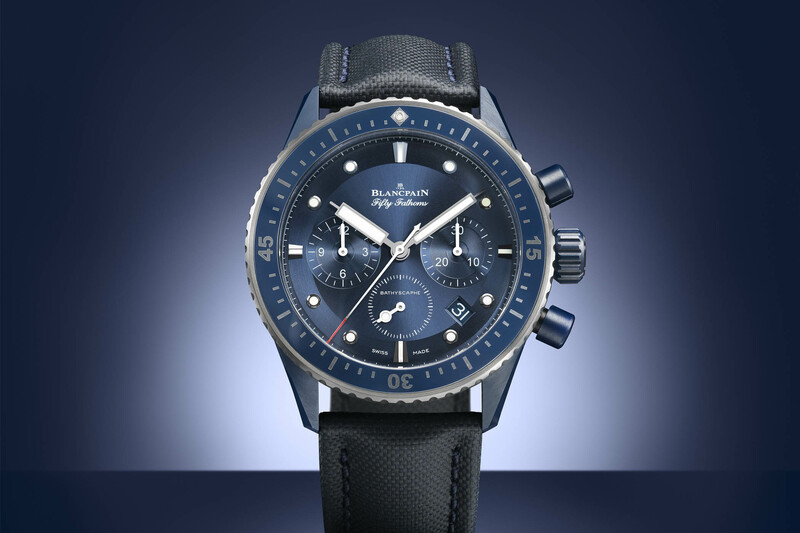 Considering blue is a trademark for all the Bucherer collaborations, this special Blancpain Fifty Fathoms Bathyscaphe comes in the brand’s brushed blue ceramic case, measuring 43.6mm wide. The unidirectional bezel, also in ceramic, is a combination of grey with a blue bezel insert. The blue ceramic case and blue bezel insert are paired with a blue dial. Lastly, to come full circle with the blue theme of the watch, a set of blue ceramic pushers and crown have been added. 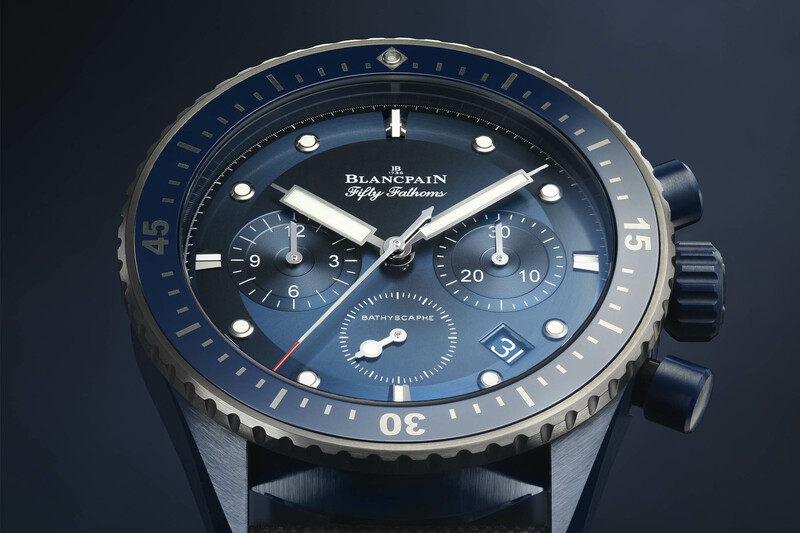 The Blancpain Fifty Fathoms Bathyscaphe Bucherer Blue Edition is equipped with the automatic Caliber F385, an integrated flyback chronograph movement with a column wheel and vertical clutch. Technically there is nothing new here, except for the unique 18k solid gold winding rotor, coated in blue and the engraved Bucherer and Blancpain logos. As a dive watch, the Blancpain Fifty Fathoms Bathyscaphe Bucherer Blue Edition remains a useful tool. 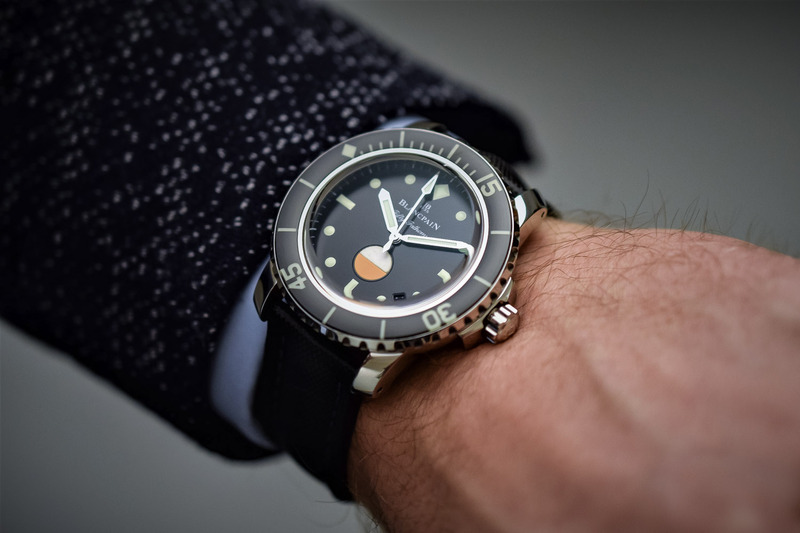 Legibility is of course key for a watch to be used underwater and there are large applied markers for the hours, and time is indicated by large hands, both coated with luminous material. Available only through the official Bucherer shops around the globe, the Blancpain Fifty Fathoms Bathyscaphe Bucherer Blue Edition is priced at EUR 17,620. 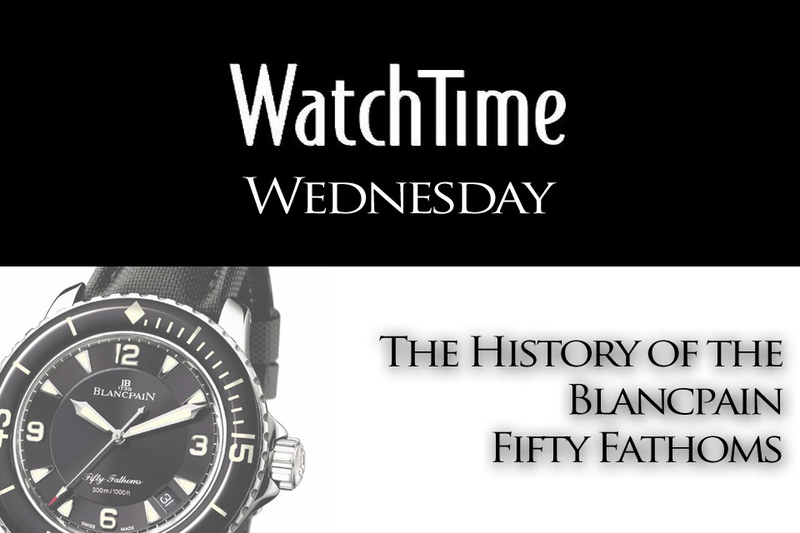 For more information: Blancpain.com and Bucherer.com.